W2BI envisages an optimized user experience of seamless communication between an array of wireless devices defined by adaptability, inclusivity and independence. We envision W2BI as being the global forerunner in shaping this interoperability within the automated wireless industry. To build strong, sustainable and long term relationships with clients the world over, by bringing forth unique, cutting-edge products and services in the most respected, transparent and efficient manner. W2BI, Inc. is an Advantest Group company and a global leader in wireless device test automation products. Serving the world’s top wireless operators, suppliers, and labs, W2BI’s software assists customers worldwide to significantly improve their device quality and time-to-market. W2BI was founded in 1997 and is headquartered in New Jersey with offices worldwide. W2BI was acquired by Advantest Corporation (NYSE:ATE) in 2013 and operates as a wholly owned subsidiary. Since its inception, W2BI has maintained a steadfast focus on delivering the highest quality device test automation solutions available, and is credited with helping the mobile industry to automate dozens of test plans. Today, W2BI remains at the forefront of technology, addressing the increased complexities brought on by the surge in the volume of data services, and by the introduction of LTE technology, now widely recognized as the global foundation for cellular communication. W2BI has released over 100 approved and over 40 additional customized test suite configurations which include mission critical applications for LTE and Multi-Mode (i.e. WCDMA, GSM, CDMA). W2BI test automation for 3G/4G runs on proven QUIKPROBE™ and Q-DAAT™ platforms. These platforms integrate with industry leading network emulators to simulate extensive network conditions and use cases. By maintaining a uniform test experience, both training time and test results analysis time are reduced. W2BI uses an adaptable architecture that allows reuse of test scripts and automation adapters with new test plans and new emulators. This results in considerable cost savings and time-to- market improvement. 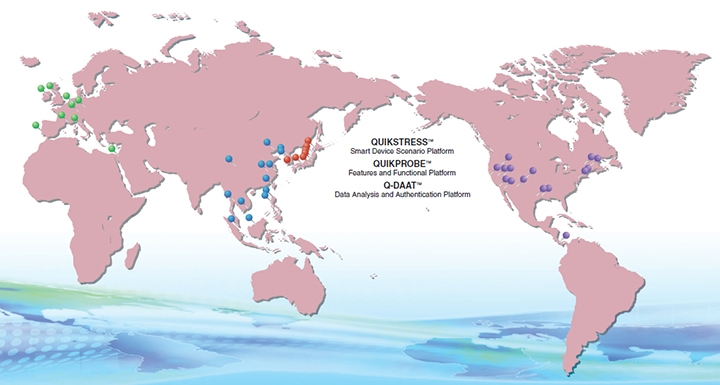 The recently introduced QUIKSTRESS™ can be used at pre-launch or in the reverse logistics processes enables the mobile industry to improve device quality, time-to-market and reduced device returns. W2BI maintains offices in North America, Asia and Europe, and partners with companies around the globe. W2BI has become a critical contributor to the rollout of LTE, VoLTE, and System Level Test globally. The company’s ISO certified labs provide custom development, field testing, and lab testing services.